In Idaho's wild and open country, a farmhouse with sweeping views is tucked between mountains and the popular Snake River. Pioneers ranging west must have rejoiced at this parcel of Idaho, a welcome site after passing over and leaving the Rocky Mountains behind. Although, just a short venture to the Oregon border, some earlier pioneers would have left the wagon train at this point. Entranced by this mountain setting, they would have determined its rolling hills and nearby tributary creeks of the great Snake River was prime land to settle and farm. Today, an old wagon wheel rests against edge of this spacious farmhouse, a testament to a lasting legacy of farm living in wide open spaces. Robin's egg blue roofing sprouts three dormer windows, centered under an iron weather vane, announcing the ever-changing wind patterns no matter how far you may roam from home. And roam you can on this farm's seventeen plus acres. 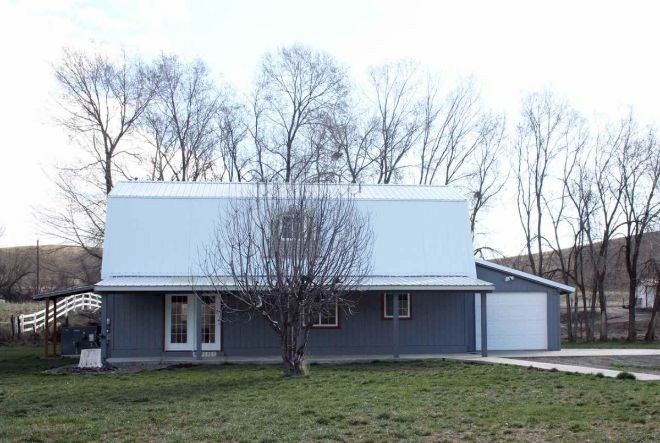 Jenny Nelson, who works for Knipe Land Company, assures this land is "a private, country setting with beautiful views of the surrounding hills." Behind a white rolling fence, a large studio in complementary shades of slate and white invites artists, builders, and dreamers to take full advantage of the quietude. 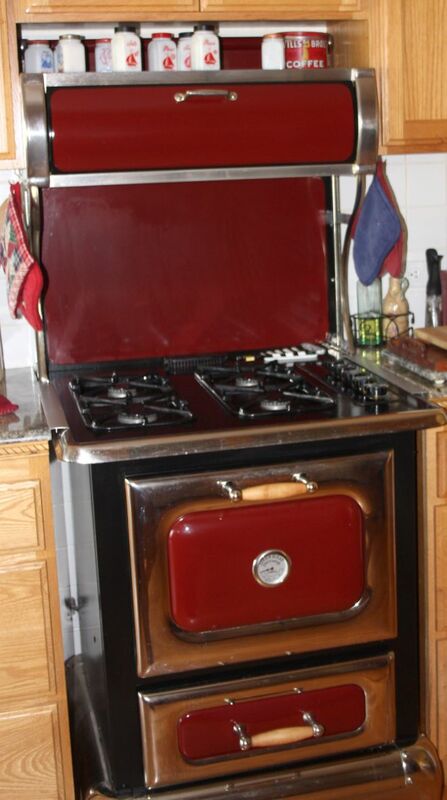 In the country kitchen, antique flour, salt and sugar jars in dutch blue and sailor red sit atop a shining cherry stove, true vintage farmhouse style. Sitting cozy with a book and warm coffee is an easy choice, its only difficulty is deciding which novel to indulge in. 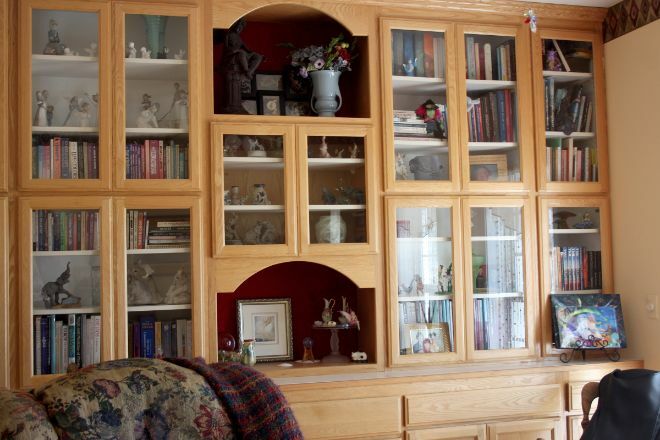 Built-in bookcases with protective glass make it easier to browse, as well as display sentimental pieces and photos of loved ones. 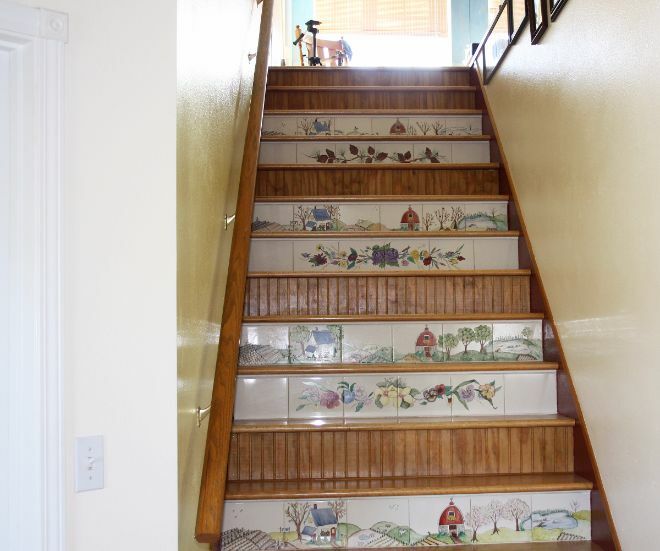 Hand-painted tiles of the farm's bounty run up the steps, alternating with images of pine cones and country flowers - yellow daffodils, periwinkle morning glories, purple pansies and varied mountain blooms. 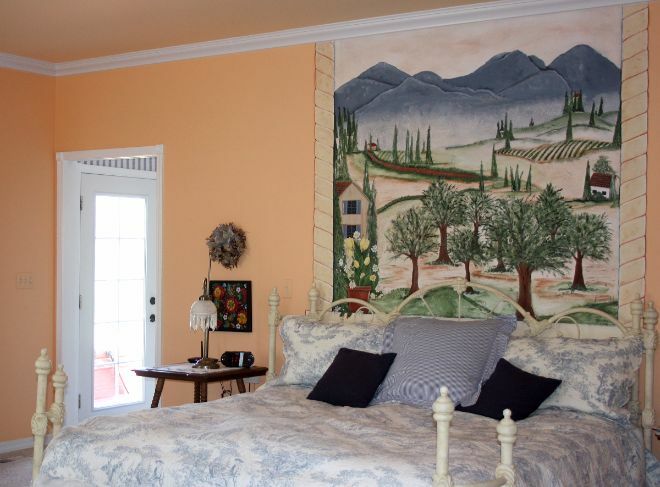 Like the original painted stair tiles, a landscape mural immortalizes the farmland's vistas of smoky hills, fertile orchards and fields. Prussian blue toile bedding tucks around the cream iron frame, lending this bedroom a touch of shabby chic. Blue accents abound. 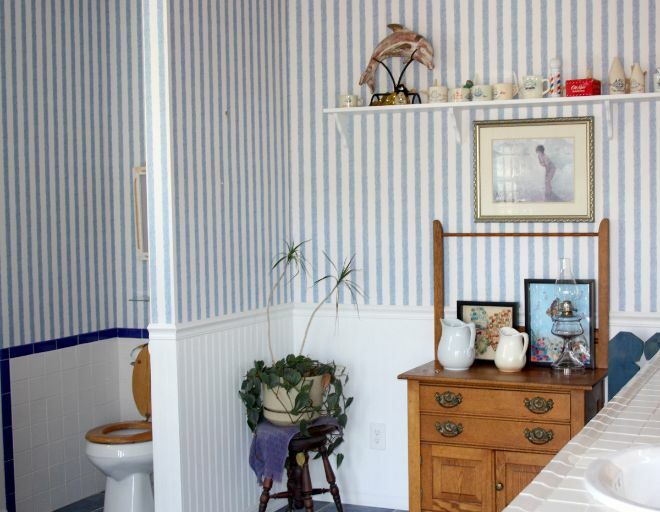 The bathroom's candy striped wall paper picks up the country theme where the white bead board meets at the carved trim. An antique washer bowl stand with original 18th-century drawer handles reminds us that running water was once a wished-for luxury. 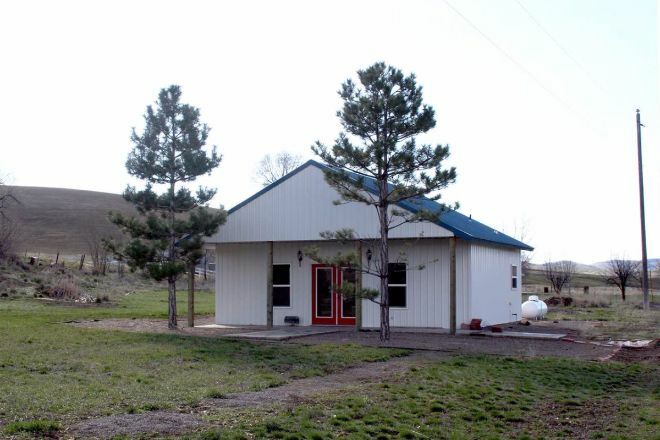 A third building on the farm is a shop to display an artisan's wares. 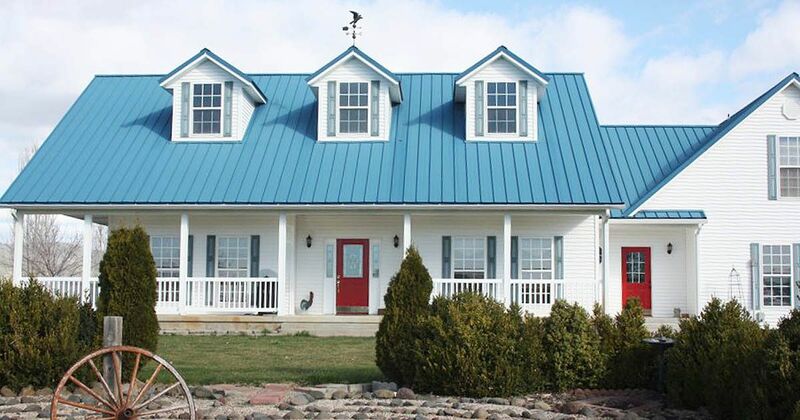 With views that pull the eye in every direction, this farm home makes staying put in the country an easy choice. Like this house? Make sure to share it with your friends!